I whole heartedly agree about HDRI Haven (Greg Zaal)! Most of the HDRIs I have used in promos and other renders come from him. He is a knight in shining armor for what he is doing and deserves to be supported! What size depends largely on whether you need crisp details in the background or not. Larger HDRIs come at a high cost to your system resources, so if you plan on blurring the background with depth of field, background is obscured, or you're not using it, then you should go with 4K wide or less (2K might be good enough). Only use 8K or better if you really need the background detail and your system can handle it. When I use 8K, things work fine but it takes probably a minute to load and things do slow down a bit in DS. Edit: I see that people are reporting that these HDRIs don't work with 3DL and I can't imagine how that is happening for people. Maybe you're not using IBL Master? ... wait I do remember something happening with some I downloaded. Try opening in photoshop or whatever image editor you have that supports HDR and then just save it out again. See if that solves your problem and please report back. Yeah which is a shame as HDRI Haven do have some really nice HDRI's, but such is life as they say.. Unfortunately I don't know enough about HDRI and its inner workings to be helpful in this circumstance. "ERROR: 3Delight Process exited abnormally: "C:/Program Files/DAZ 3D/DAZStudio4/bin/tdlmake.exe -mode periodic -deflate C:/work/piazza_san_marco_8k.hdr C:/Users/HAC/AppData/Roaming/DAZ 3D/Studio4/temp/d6_piazza_san_marco_8k.tdl"
tdlmake: error while making texture file"
Now if one loads the HDRI have file into Picturenaut (free) and saves - it seems to work just fine.. Thank you. That identifies the specifics and confirms my recommendation. I would add, though, that folks who are having the problem should test with 4K or smaller, so as not to tax say a laptop or less beefy system. ...IBL Master is contingent on the CMS? That's not good. I haven't been able to get the CMS working properly since moving to 4.9. It shows as being active in Task Manager (Processes tab), It shows up with a port number in the Preferences tab in Daz, but there's no highlighting of content in the content pane. I am also using the current format and transferred my database over from the old Valentina one (since 4.7). The renders are ver nice, good work! But they don't show me what is causing the problem you ar having with rotating the light. What you expect the helper to do is correct. Can you show me a screeshot of render settings? For the preview to be seen in the viewport in realtime, you need the drawstyle to be one that show textures ( texture shaded or wire texture shaded ). Thanks! I did download the 8k version of some of those. I really like some of them. I think I need to learn more about HDRIs too. Is resizing an issue or should I maybe download a 4K version? Yes, that was a good recommendation. Also, resizing should not be an issue as long as you are scaling down. So I had a bit more time to mess with this, and found that IBL Master does in fact work with 4.9. The mistake I was making was assuming that Control Sphere is what I needed to rotate in order to rotate the Iray environment. It isn't; the name "Control Sphere" is what caused my confusioon. I thought it was used to "control" the rotation, but IBL Master is what does that. 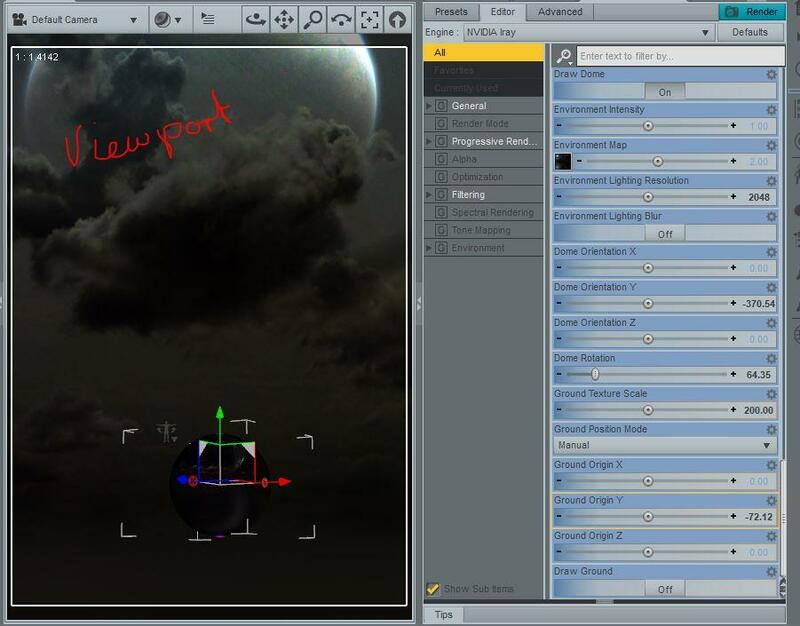 If I rotate the IBL Master itself, the main node in Scene Tab, the Environment rotates accordingly. Simple. And seeing a bit more about what the product does, in terms of syncing Iray and 3DL environment spheres, it seems obvious in hindsight. So, one confusion out of the way. I tried working with the 3DL aspect of the tool, and found some additional oddnesses in rendering. Error msgs, lots of error msgs. I forgot to bring a screenshot of the log file this trip. I should say that I have little experience with IBL's in 3DL, because of difficulties getting the image to show up as I want it to, in terms of size. If I want to see more of the IBL-a wider view, or less-a more close oup view, manipulating scale and magnifier gets confusing. Mostly now, for Iray, I use packaged HDR sets, assuming the author's set up will be close enough. It isn't always, but I'd rather not waste time in frustration. So, is there a "If you want a wide view of the IBL, do this," and "If you want a close up view, do this" kind of setting base? My experiments always seem to get protracted and distracting. With IBL Master, some confusion has to do with what the Control Spere is showing me, relative to the rendered environment. The rotation isn't exact, and sometimes seems to be 180 degrees out, like the part of the Control Sphere I see represents what is behind the camera. ??? I can work with it, though, and get an approximate, which is useful. Using Iray draw style with just the hdr is fairly quick, but any additional scene objects bog my machine down to a standstill. Thanks, outrider42. My issue with 4.10 has to do with the version of Open CL, which my ancient laptop can't support, so no real advance in upgrading from 4.9. I thought that might be the issue with IBL Master, but it isn't. There is, so far as I've yet found, no issue using OBL Master in Studio 4.9. I don't mess with compositing, so some features of IBL Master will probably not be of use to me, but as I get to work with it more, I can see it helping. The ghost lights are next on my experiment calendar. Parris's promo video was helpful. A product like this cries out for a detailed pdf, though. Would have saved a lot of time and confusion. I'm not sure if the CMS is the case. Resetting the dome rotation on the Render Settings/Environment tab is absolutely necessary tho so that the IBL Master can take over for the dome rotation and so that what you see in the viewport is what you get. The CMS was just a guess because until I started it, nothing was working for me. But it might have been just the dome rotation reset that caused my problem. IBL Master doesn't make Image Based Light work in Iray (it already works fine), kind of the other way arround. There are aspects of IBL that didn't work properly in 3DL (inside of DS) until now (with IBL Master). However, any properly formatted HDRI will now work with either renderer. I don't know about Lantios products specifically, but this will not make a skydome designed for 3DL work in Iray. However, if the textures you mention are designed for a sphere (not a half dome or other) then you should be able to use them with Iray and/or IBL Master. 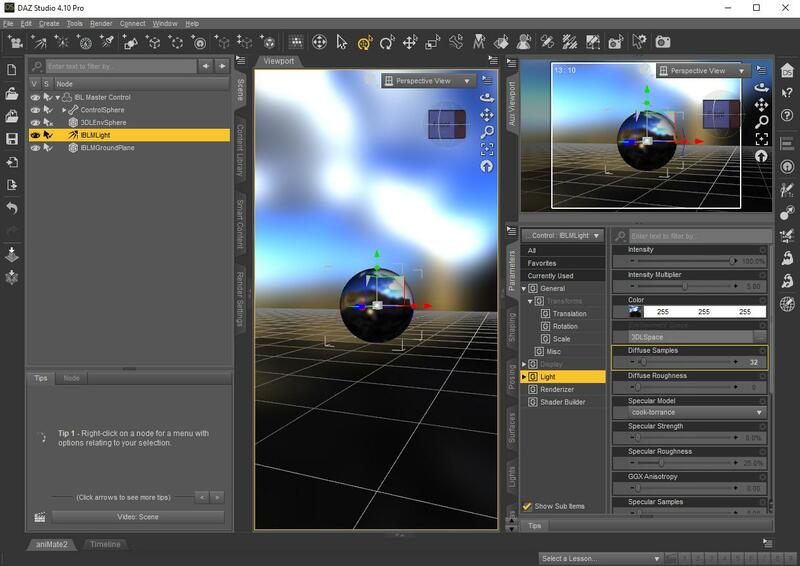 You will likely have to use the Browse method though, because a preset designed for a specific skydome may not load the image into the Iray Environment Dome or IBL Master. The Iray side with remote control will work, but the 3DL side will not. That should explain why you are getting error messages. This is because Daz had to make changes to how DS worked so that controlling direction of the light would work properly. 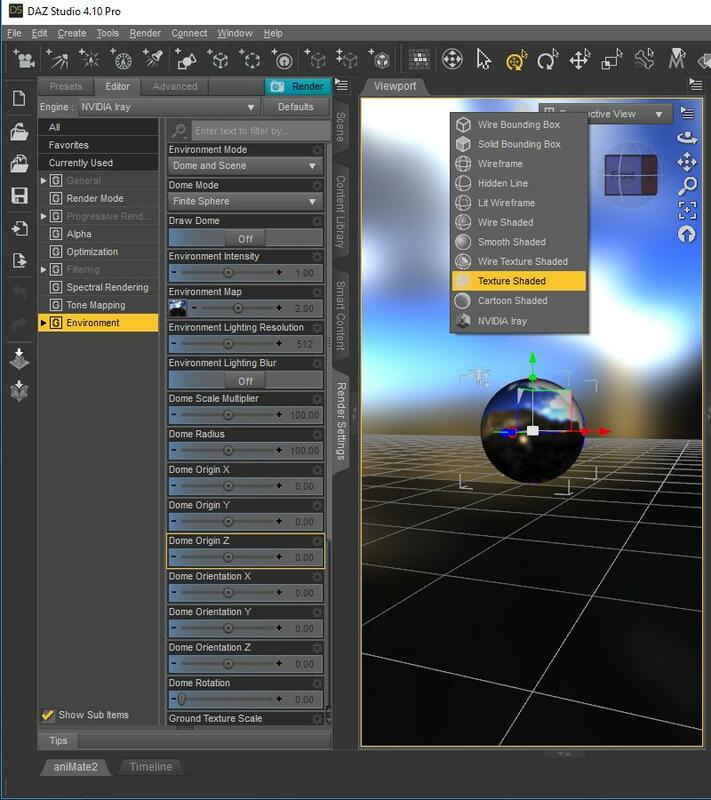 IBL Master's small preview sphere is specifically there to address the problem of not being able to see enough of the HDRI at any given time. And it's rotation is exact, but you have to think of it as a tiny world view - oriented the same as the background sphere and the IBL. The reason it appears to be rotated 180 degrees is because you are viewing it from the outside (God's Eye View), whereas you are looking at the inside of the background sphere. I guess it takes some flipping of perception depending on what you are used to. Have you reviewed the three sets of detailed instructions that are in the same directory as IBL Master? I put them there because a lot of people have trouble finding a PDF. LOVE IT!!! Can't say I've ever seen a render out of 3DL inside DS that looks more convincing. Believable as a scene from an A-list video game or a Movie. Algovincian, would you please share this in the appreciation thread, or can I have you permission to post it there? @algovincian I have some questions about shooting HDRI if you have the time. Thanks so much! Glad to hear you like the image, @Parris. I'm no longer home and on my phone, so go for it! Also, if you'd like to use a larger version for promotional purposes, you're more than welcome to. Just let me know and I'll send it to you when I get home. Saw that you messaged me but am short on time at the moment, @posecast - will respond to your PM when I return home. More confusion that I'll have to experiment and clear up. I think what I found was that 3DL does work, but backwards, the render is 180 out. I'll check again. If 4.10 is required, that needs to be specified; not a new issue to Daz3D. For the record, though, I did install 4.10 temporarily, and using Iray drawstyle, the preview/control sphere disappeared. The square bounding box lines were in place, but no sphere, at which point, all bets being off, I reverted back to 4.9. The inexactitude, placing an object with IBL Master rotation at zero, noting the position of the rendered shadow, (which does work in 4.9 3DL), rotate 180, render. The shadows don't appear to be opposite on the horizontal axis as they should be. I do see the point of the preview sphere, (why, then, call it Control Sphere?, or am I still missing the obvious?). The question for me is about the rendered environment scale. Are you saying that scaling the preview sphere changes the scale of the rendered environment? I don't see that changing the Iray Environment settings for mulitplier or scale appear in the preview sphere; it just shows the entire hdr rotationally.... The end result rendered scale is what I want to understand, and I don't see how the preview sphere relates to that objective. I did, as I said, work from the Instruction planes. I've never had any trouble finding an included pdf when there is one. Putting the pdf in a documentation folder, along with data, shader preset, runtime, or whatever folders, like so many other artist/venders do, works quite well. At least for those who do manual downloads, as I do. If that's an issue with dim or something, include it in a separate manual download folder. Simple. In any case, no point in circular posting. Thanks for attempting to clarify. I'll go from here and see what I can discover about best uses of IBL Master to get where I want to go. I have a starter file that automatically loads with some settings and useful items; I just added to it. I've also put links to such images (etc) on the desktop; didn't feel the need this time... Yet. Or you can find the actual crisp clear originals (1024x1024) in the runtime folder of the library where IBL Master is installed - Runtime > Textures > Parris > IBL Master. Thank you. This does appear to have been the problem. I have several HDRIs that load with the rotation altered so it's good to know what to check.